We love timeless essentials like our new woven cotton blankets. You can use our Cable Weave and Chevron Weave blankets in any season and they always coordinate with your other bedding. Plus, they get even better with every wash so you can enjoy them for years. We think you’d be hard pressed to find a better blanket. Here’s why. 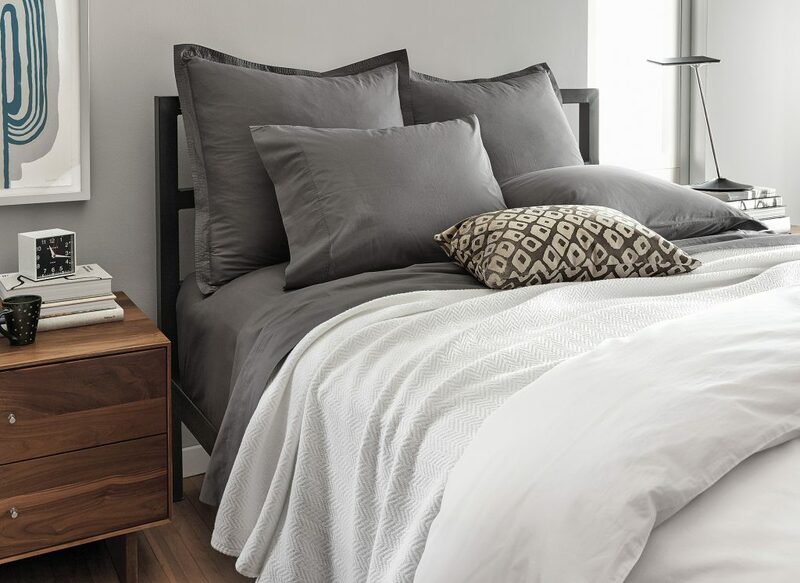 With only a handful of large textile looms left in the U.S., good quality American-made bedding is hard to find. But we’ve found it thanks to our new manufacturing partner Maine Heritage Weavers. The history of this Monmouth, Maine, company dates back to the 1850s when it made blankets and uniforms for Union soldiers. The team who works there today has more than 350 years of combined experience and many have family ties to the business. In their words, their bedding is “loomed to be heirloomed.” We love their infectious sense of pride. These versatile cotton blankets work as a bedding layer, or as summer stand-alone. Cable is shown at top and Chevron above. Our blankets are made from 100% cotton. Like your favorite t-shirt, they get softer with each wash. An all-cotton blanket is also the most breathable—it feels cool in the summer and warm in the winter. Plus, it’s machine washable. Weaving is a tighter construction method than knitting, which tends to stretch. Our woven blankets have a dense, substantial feel and they’ll hold their shape no matter how much you toss and turn. 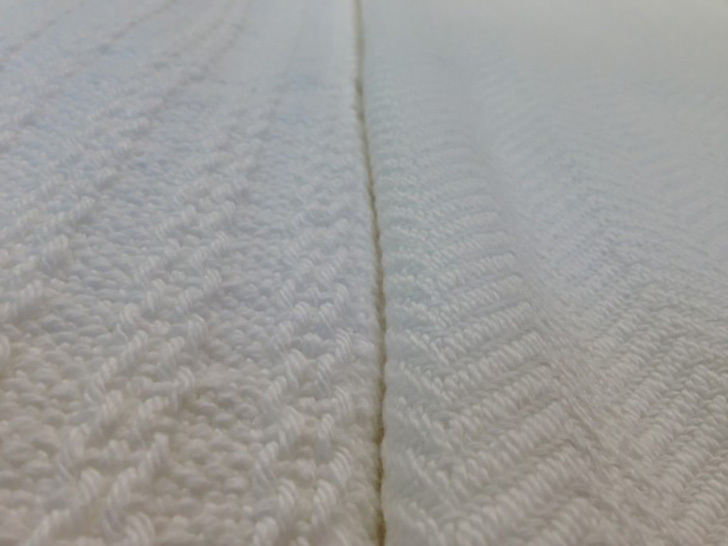 A close-up of the texture of our super soft Cable Weave (left) and Chevron Weave blankets (right). Once the blankets are woven, they’re washed and dried. This means that when you open the package, your blanket is clean and it’s the texture and size you can expect it to stay. Thanks to the pre-wash, the blankets shrink less than 2% with washing and drying at home. These new bedding favorites are available in twin, full/queen, king and even baby blanket sizes. 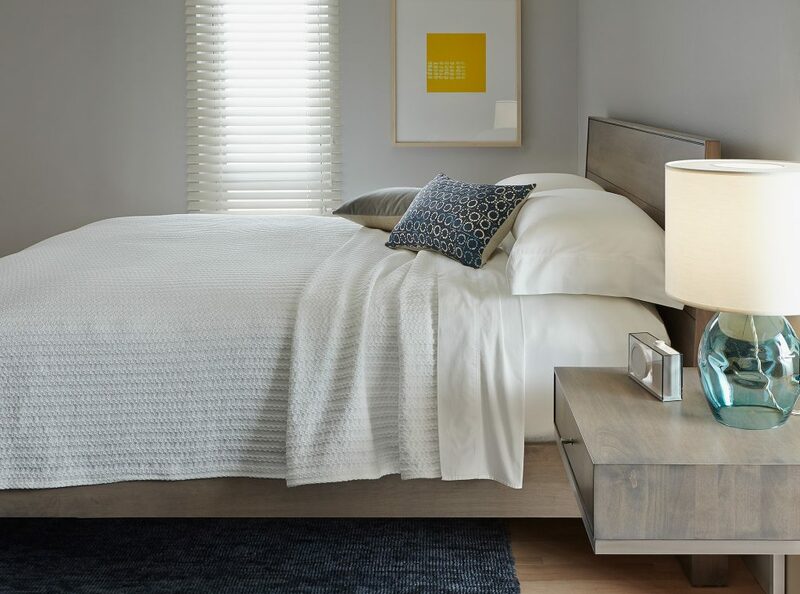 Check them out in stores or online at roomandboard.com.